Tonight, I decided to make a diaper bag as the gift wrapping on a “Welcome to the World, Baby!” package for a young cousin. I’m proud enough of the results to share ’em here. A young cousin of mine recently had a baby — one of the first babies in my generation of cousins! — and some complications meant she delivered several weeks premature. I wanted to send the new mom some “Welcome to the World, Baby!” goodies, so I’ve been compiling a package. I’m slow at these kinds of things, but I finally have a good pile of things collected. So, tonight, I decided also to make a diaper bag as the packaging for everything. 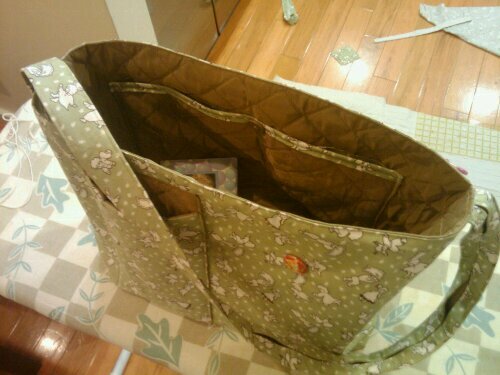 I’ve made a few bags in the past, and took some inspiration from a random Google result, to put together a nice roomy tote with padded lining and a cute, green print outside. I think it turned out pretty good, if I do say so myself! Look, it has a bottle pocket!